What’s the 1 Thing I Can Do To Make My Students Better Writers? For the first ten years of my career, this was a question I wrestled with constantly. I purchased my fair share of books and attended more than a few workshops in search of the answer. I did find it, but I did realize it. So I kept looking. It turns out the answer came in year three of my teaching. I gave it a try then. Several times actually. But because I couldn’t make it work on those trials, I decided that it wasn’t for me and moved on. But now I’m back, and more convinced than ever. What makes students better writers? The answer is simple: More writing. That’s it. Make them write more. Make them write everyday. Make them write at the start of a lesson. Make them write at the end of a lesson. Make them write for homework. Write. Write. Write. Stop! We need to get something cleared up first. When you think of student writing, you think of an assignment that is long and complicated, like an essay, right? Sure, that’s a type of student writing. And if that’s the only kind of writing assignment you give, then you are probably thinking that more of that will just drive you and your students nuts. And you would be correct. Nobody wants students to write more and more essays, especially because someone (you) would have to grade those essays! Instead, the kind of writing I am talking about in this post is low-pressure, low-stakes writing. In my classroom, students do this low-pressure writing in a Writer’s Notebook–a 100 page, wide-rule composition book. They work out of it daily. It has been the most valuable tool for writing instruction that I have ever used. It’s so valuable, I have written a book about it–Really, it’s more of a field manual for implementing it in the classroom. It will be out soon (more on that in later posts). 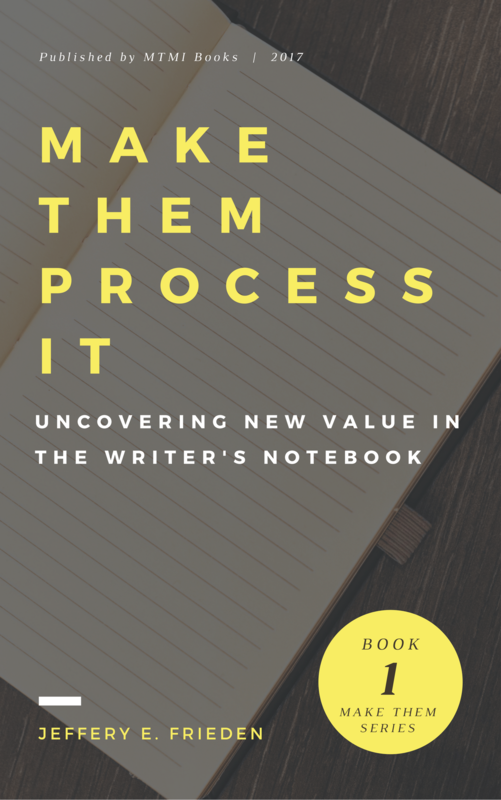 Why is the Writer’s Notebook such a great tool? It is a pressure-free space for students to write what comes to mind about a topic they choose. There is very little they can do wrong. It’s a place for them to practice skills, develop ideas and, most importantly, revisit first drafts to turn into high quality second drafts. Tell me if this sounds familiar. I used to put all of the pressure of writing instruction on the big essay the students would write each quarter. they were high-stakes, pressure-filled, academically complex assignments. I would teach them grammar, format, how to quote, how to paraphrase, how revise writing, and on and on. I would pile on so many different lessons and requirements that by the time we were done, we all hated writing. Then I would get frustrated that they would turn in poor quality writing. But it wasn’t their fault. They had no practice. Instead of throwing the students into writing when it’s high-stakes, pressure-filled and academically complex, I take all the pressure off. My students get a chance to build some writing, revision, and editing “muscle memory” before they get to the writing that really counts–at least in the grade book. Just like athletes that chalk-talk and run drills at practice before they show up on game day, students need to practice writing before they really write. The answer is to assign and teach more writing. Not essays. Writing. Make your students do more and more of it. Let them do it their way. Let them make all kinds of mistakes. And let them learn from those mistakes. DO NOT give them more essays. That is not the answer. But you should make them write a lot. What is one thing out of your past that made you a better writer? How do you get students to produce great writing in your class? Comment below and share this post with a friend.